At the Visual Literacy for Management course we just had a very interesting guest lecture by Sebastian Kernbach of Interbrand, the biggest brand consultancy in the world. He gave a lecture on branding, focusing on the visulization aspect and also on the benefits of using sketching for developing a brand campaign, which is the topic of his research. In the picture below he was explaining how social media affect the relationship people have with brands. With sketches, of course! The symposium “Un mondo alla rovescia: quale ruolo per la cooperazione internazionale” took place last Saturday in Lugano, organized by Fosit (Federazione ONG della Svizzera italiana) and USI’s MIC program (Master of Advances Studies in intercultural Communication), among others. During the morning a panel of experts on the topic of International Cooperation had a provocative discussion on ‘the world upside-down’. With the recent economic crisis we are witnessing profound changes in international cooperation: which countries need help and which kind of help. The moderator brought data regarding public debt, with Greece and southern European states having public debt-to GDP ratio 4 times bigger than many African states, as Uganda and Zambia for instance. Although I appreciate the innovative take on the issue, by the end of the panel I felt as the real problems have been somehow forgotten, giving to the public the impression that there are no more problems that require our attention in Africa or Asia. Thus I greatly appreciated the intervention by prof. Poglia, pointing out that problems are still real and far from being solved, since many countries still have a life expectancy of 40 years (compared to 80 for Developed countries), just to cite one parameter. The afternoon was focused on specific themes, and I chose to attend “dalla cooperazione al mercato”. A very authentic and insightful presentation was given by Jean-Claude Luvini, founder and head of Masaba coffe Switzerland, and by Florian AnderHub, founder of AnderGroup, the branding agency which helped Masaba creating a professional brand (and follow the philosophy of “do good”). Masaba coffee is selling fair trade coffee from Uganda, rosted in Italy: “Masaba helps small farmers in Uganda produce a coffee of excellence, in respect of fair trade and organic agriculture” (source: website). We concluded the day with a taste of this premium coffee, which was indeed excellent – in addition to provide help to Ugandan farmers… a social enterprise from Ticino! For celebrating Mahatma Gandhi’s Birthday – today October 2nd – I would like to reproduce a visual ‘summary’ of his teaching. Hopefully it will be inspirational! 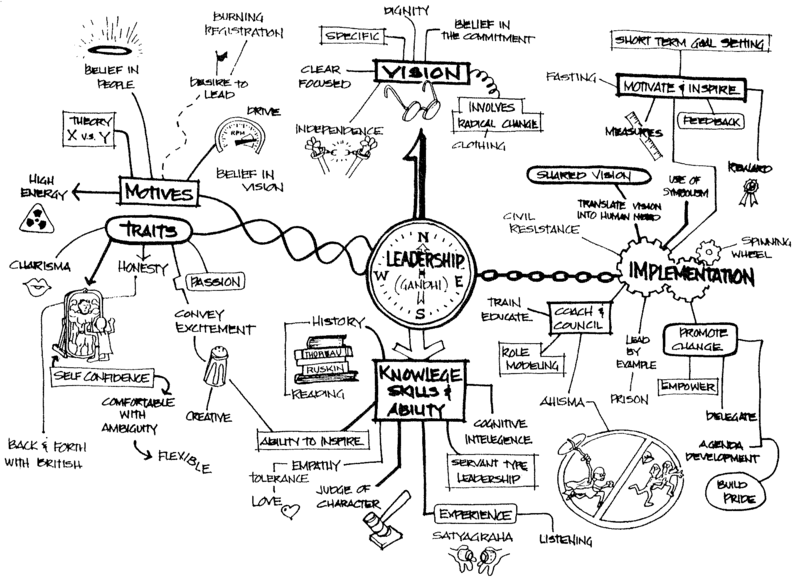 Source: Anthony J. Mento, Patrick Martinelli, Raymond M. Jones, (1999) “Mind mapping in executive education: applications and outcomes“, Journal of Management Development, Vol. 18 Iss: 4, pp.390 – 416. You are currently browsing the Sabrina Bresciani blog archives for October, 2012.